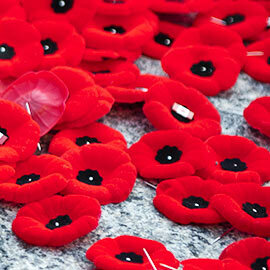 All members of the Laurier community are invited to attend Remembrance Day ceremonies on Friday, Nov. 11 at a number of locations on or around Laurier’s Waterloo and Brantford campuses and Toronto office. The Laurier History Students’ Association (HSA) will be hosting a Remembrance Day ceremony in the Concourse starting at 10:45 a.m. Speakers will include: Roger Sarty, a history professor and former historian with the Department of National Defence, and David McMurray, vice-president: Student Affairs, who will read In Flanders Fields. In uptown Waterloo, a parade will march from the Royal Canadian Legion Branch 530 to the cenotaph on Regina St. between 10 a.m. and 10:15 a.m., with the ceremony getting underway at 10:15 a.m.
More details on Remembrance Day ceremonies in Waterloo Region can be found in The Record. A ceremony will be held at Toronto’s Old City Hall Cenotaph, located at 60 Queen St. W, at 10:45 a.m. Ceremonies will also take place at Civic Centres across Toronto, as well as at Fort York.